One of the most notable of all the gaming genres is the 2D shooter. And while the number of such titles in the App Store is growing, there is a sore lack of true quality offerings available for the iPhone. We recently learned that an upcoming release from Namco’s classics catalog will soon give shooter fans something to smile about. Namco’s arcade classic Galaga, widely considered to be one of the best arcade shooters of all time, is about to blast into the App Store in the form of Galaga Remix. This evening I spoke with several members of Namco’s mobile group who shared details of this impending iPhone release. Galaga Remix is two games in one. While the 1981 classic that shooter fans have grown to know and love is here in all it’s pixellated glory, a greatly enhanced take on the franchise is also represented. 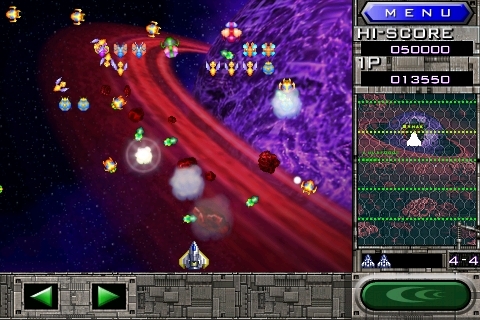 Basically an iPhone version of Namco’s Galaga Arrangement, a 1995 arcade title that has since appeared on various consoles including the PSP, the Remix side of Galaga Remix is a widescreen affair with frantic onscreen action, level bosses, and infinite continues. 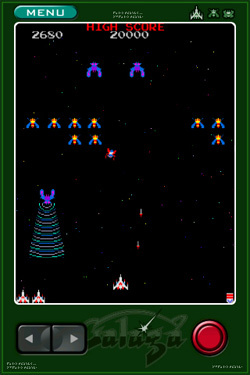 In classic Galaga, the only powerup available was riding up the alien insect’s beam to achieve a side-by-side ship arrangement, at the expense of a spare life. Remix features nine different actual powerups (three levels of three distinct weapons improvements) including spray shots and supercharged laser cannons. The game features 36 levels with changing galactic scenery and a massive boss insect (and its smaller minions) at the end of each series of six levels. And while the classic game of Galaga is played in portrait orientation, Galaga Remix is played in widescreen, landscape. See Namco’s preview video to see Galaga Remix in action. The arrival of Galaga on the iPhone represents an extremely significant addition to the iPhone game library. We can’t wait to get our hands on Galaga Remix and will post a detailed hands-on when the game goes live. Galaga Remix will arrive in the App Store any day now and will be priced at $5.99.